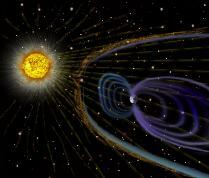 Illustration of solar wind heading into space and impacting Earth's protective magnetic shield, its magnetosphere. The particles are seen heading out in all directions, but with some of them hitting our magnetosphere. Earth's magnetic field lines are shown in concentric purple ovals, pushed on by pressure from the Sun and elongated on the side facing sway from the Sun. If the solar wind is particularly strong or if a solar storm impacts us, their energy can be transferred down to Earth via our magnetic field lines and cause power, communication, and navigation problems.